Steiff Alpaca Santa Discounts Apply ! Made from The Finest High Quality Polar White Dense Alpaca. Superb Polar white Alpaca Santa in his Santa Red Coat held closed by his big Santa Belt . His Hat can be taken off to show his lovely looking face , this is a lovely Santa to add to steiffs Winter Collection . 5 way jointed with Safety Eyes and stuffed with Safety Filling, and with gold-plated "Button in Ear" and Surface Washable. 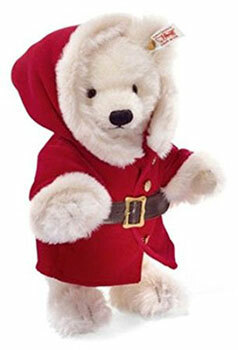 This Bear is part of Steiff's 2008 Exclusive range.